Director Yvonne Labarge and screenwriter (and star) Audrey Noone deliver an uproarious glimpse into a decidedly unconventional relationship with the phenomenal five and a half minute short, “What the Doctor Ordered”. The comedic endeavor concerns Sandra (Noone in a tremendously realized and well-timed performance) and Thomas (Sean McPherson in a portrayal that evokes the simultaneous confusion and varied attempts to keep the romance going in whatever manner possible his character conveys beautifully). While speaking to a psychiatrist (Jeanne Lohnes in a wonderful acting turn) the pinnacles of anger and admiration between Sandra and Thomas, and the underlying notion that these motions might all be an elaborate game between the two, are addressed in a succession of flashbacks. These moments are always amusing. They induce a perfectly conceived atmosphere for the continuously light-hearted gaze of the narrative. Moreover, Labarge and Noone never loses sight of their humorous intentions. Reccurring gags about food fights, and how Sandra uses the source of the combat to win Thomas over, are especially effective. It also provides a smirk-inducing punctuation mark for the story to conclude on. These components provide verified proof that the comic nature of this brief film endures unflinchingly stalwart throughout the affair. Still, there is an innocent, caring heart beneath the joviality and the mirth that makes the leads charismatic, endearing, relatable and authentic. The original music by Zachary Krodel is perfectly fitting for the defiantly upbeat, sitcom-like nature of this chronicle. This is what strikes us instantly in the opening instances of this exertion and it wins us over immediately. Krodel’s immediately mood-setting, optimistic score is heard over a dark screen as the title is written out in whipped cream, in a nod to another of the numerous successful jokes, in the opening moments. Such an achievement, heightened by the fantastic sound design by Jeremy Eisener and vibrant cinematography and lighting from Mike Sun, are just a few of the many triumphs this work generates. There is also an incredible display of animation from Danielle Lauretano. This contribution captures the spirit of the plot splendidly. It also adds considerably to the on-screen visual appeal. The composition also victoriously settles into a rapid-fire pace. This attribute appears so casual, and is simultaneously so enthralling throughout, that the piece never feels rushed. Such is surely an envy deriving characteristic. It is also a compliment to how apparently graceful, striking and well-done the whole endeavor remains during its runtime. The writing by Noone and direction by Labarge, who also provides the seamless editing on display here, is brisk, sharp and vivid. They make an incredible team. This factor illuminates the final result spectacularly. “What the Doctor Ordered” is the product of a year- long undertaking. It is a labor of love where the time, effort and commitment by all of those involved is emitted gloriously. This makes what we are given here all the more delightful to behold and wondrous to laugh along with. Noone and Labarge have utilized all the endlessly witty and high-caliber ingredients mentioned above. This, as well as the welcome contributions from an equally capable cast, come together to craft a truly special cinematic treat. A film noir take on the supernatural thriller, writer and director Mark W. Curran’s Abandoned Dead, suffers from an all too familiar late twist. Curran’s film focuses on Rachel Burke (Sarah Nicklin in a competent performance). She is a security guard for a healing facility. Called into the night shift she eventually begins sensing a terrifying presence slowly resonating about her. But, what is it? What does it want and why? Despite an atmospheric score and mood draped cinematography by Robert Adams the seventy-seven minute feature (the DVD is reported to run eighty-five minutes) never dares peer that pensively at its narrative. Instead Curran’s story follows suit with many horror works of our day. It does this by keeping everything on a surface level. In turn, most of the effort is composed of many long shots. This is punctuated by the far too common sight of Nicklin pointing a flashlight into darkness. We are also handed endless walks down hallways. Alongside this we get ample doses of what could perhaps be paranormal activity. All of these elements are well done. They provide stupendous atmosphere if that is all you wish for from a terror venture. Still, it leaves us with little to distinguish it from its genre peers. The pace moves in much the same traditional fashion. For most of the piece Curran and his filmmakers successfully build a gradual sense of menace that, ultimately, leads nowhere new. When Night of the Living Dead star Judith O’ Dea shows up late in the cinematic composition the sight of such a genre legend adds an element of credibility to the feature. Her performance as Doctor Pamela Myers is solid and enjoyable. Moreover, the rest of the cast, especially Robert E. Wilhelm as Doctor Thaddeus Mayfield and Carlos Ramirez as Detective Phillip Haggis, fares just as well. The special effects by Melanie Aksamit and Hannah Sherer are effective. They are also minimally used. This helps heighten the impact of the picture as a whole. The nuance of these characteristics often gives the proceedings a classic thriller veneer. Such an attribute is much appreciated. Curran’s impressive directorial flare and intriguingly constructed screenplay also help matters. The main function of Abandoned Dead is to build an impression of unease. It does this satisfactorily. Moreover, it incorporates a few moments that are genuinely unnerving. Regardless, it often feels as if it is going through the motions. It also appears unsure of itself at times. This is overall fair entertainment. Still, I can’t help but think that we could’ve had something truly special. This entry in fear evoking comes up a bit lacking in the end. Such an impression is brought upon because we leave the picture wishing that as much emphasis was put on the resolution as there was with building suspense. Abandoned Dead is one case where the pieces are far more fascinating than the actual scene they together visualize. Curran’s latest is more about the experience, the journey than the actual destination. There’s an abstract beauty beneath the equally appealing visual style of writer and director Mike Messier’s 2014 short film, “Nature of the Flame”. It is established early with shots of a body of water and feet, in a suggestion of serenity, wading in the stream. Suddenly we cut to a woman (Lindsey Elisabeth Cork in a tremendously wrought performance) sleeping. After being told she isn’t prepared for enlightenment by an elusive figure (Jocelyn Padilla in an appropriately transcendent acting turn) in a monastery Cork wakes up in a cave. Messier wisely gives us the room to come to our own conclusions with these inquiries. This is welcome since if concrete answers were provided it might’ve taken away from the ethereal, haunting, meditative experience at hand. Despite these lingering questions one thing we know for certain is that Messier and company have captured the confusion and potential sense of ascension that can be tied to the narrative elements terrifically well. Furthermore, Messier evokes an even, appropriate pace throughout the endeavor. But, the smartest move is that Messier allows the audience to attach his or her own conclusion as to the proceedings. This is done by letting a succession of gentle, intimate, ardent, and attractively executed and shot, sequences speak for itself. There is no dialogue in the last five and a half minutes. This decision adds layers of skillfulness, invention and sentiment upon an already gripping set-up. The musical score, along with Chris Hunter’s editing, enhances the illusion of going to what could be perceived to be a higher plane. Moreover, Messier’s writing and directing are intelligent and illuminating. The cinematography captures the allure and enigma of the storyline with an equally striking veneer. “Nature of the Flame” captures all of the sentiment and drama of a full-length feature in just under eight minutes. It is always stunning to look at, to be caught up in and to think about long after its serene conclusion. This is more than a brief fling with cinema: it is an exhibition of craft. This is an intriguing concept. It is made all the more impressive when we realize it all takes place in a solitary basement setting. “Hail! Hail” speaks its volumes in one beautifully execute sequence. Most astonishingly, it defines the sum of an intimate affiliation in several grand gestures. These, in turn, smartly disperse a lifetime of information about the leads quickly and believably. What is equally fascinating, and another of many wise moves on behalf of the creative team, is that it all occurs in a breathlessly brisk four minute runtime. In this quick duration it never loses focuses of the unique connection between the pair on-screen. Moreover, it never forgets its initial concept. When this visually crisp work (courtesy of DeMello’s rich cinematography) opens Robbie (Anna Rizzo in another terrific turn which further exhibits her great range as an actress) awaits the return of Roseanne (Jessica Rockwood in a role that captures her character’s essence terrifically). Robbie passes this time while playing a bass guitar. Moreover, she finds herself talking to a recording camera in front of her. This is done in an act which delivers character development in an entertaining, engaging fashion. It follows the sum of the piece by being fresh and vigorous. Also, it never feels forced. When Roseanne arrives she brings with her an argument over fast food. This quickly escalates into a credible rollercoaster ride of realistic emotion. This is captured in an ending which signifies the cycle of the rapport either ending or beginning anew. To compliment Messier’s well-honed screenplay there are also plenty of moments which exhibit DeMello’s directorial flare. In one case we follow Roseanne’s heels treading down the basement steps as Robbie waits. This is seen from beneath the stairway in a manner that is striking and impressive. DeMello also ends the short with a shot that is a stunning, creative angle. It is also the perfect punctuation point to conclude on and summarize what came beforehand. Further helping “Hail! Hail” achieve its charismatic effectiveness is the end credit sequence. It calls to mind the veneer of such segments by Italian master Pier Paolo Pasolini. This is incorporated with a wonderfully realized touch of modern music. When “Mr. Suitcase” by Sun@ndmun (released through Hip Hop Star Inc.) arises in this final segment it give the proceedings an appropriately sensual allure. It is another act that reiterates the mood of the story remarkably. This is all complimented further by Mark Hutchinson’s sound design. Lighting engineer Jill Poisson does a terrific job helping create the seamless tone of this piece. To its further credit, the make-up by Kaitlyn Ciampa is exemplary. 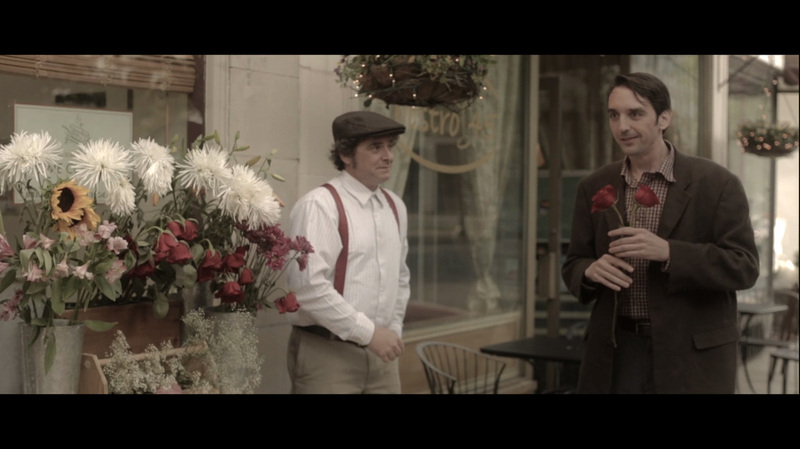 The entirety of this short was filmed in a single day. Given the impeccable professionalism radiating from every technical avenue on-screen this is especially incredible. “Hail! Hail!” is a riveting experience. It proves how much a group of incredibly talented individuals can accomplish in a small time span. I greatly anticipate the sight of what future marvels this gifted team has in store. “Dead Hearts”, a sixteen minute short from director Ramzees Carvalho (2014’s “Night of the Damned”), opens with four young adults trapped in a cellar. Radio broadcasts are announcing that the reanimated are coming back to life. When a chilling chain of events transpire it is up to Dan (Carvalho himself in an impressive, spectacularly wrought performance) to take the reins of heroism. With this action he must face the ravenous hoards of the undead. It’s a classic set-up that brings to mind visions of George A. Romero’s timeless 1968 gem, Night of the Living Dead. To further the sense of unabashed reminiscence this wonderful short (the second by Carvalho) induces is crisp, vivid and rich cinematography from Nelson Reis. The special makeup effects by Manny Savini only heightens the appeal. The zombies, and their veneer, are stalwart, gritty and credible at every turn. Such attributes resonate amid the numerous well-done decapitations and various other gory bits. This is because there is a palpable sense of camaraderie between all the leads. This is most noticeable between Dan and Liz (in a performance by Alyssa Paige Moreno that is every bit as strong and understated as the role demands). Their relationship is the propelling force of most of the narrative. The work is all the more commanding because of the sheer strength of their portrayals. Ramzees Carvalho and Moreno prove they are more than apt to take on what the taunt, intelligent script that has a Stephen King-like eye for characterizations, also by Carvalho, demands. Cameron Perrault, as Luke, and Luke Eleuterio, as Alex, fare just as spectacularly. They further add to the sense of kinship and authenticity pulsating through every frame. This isn’t the only factor which contributes to this triumphant success. The work constructed in all other technical arenas are phenomenal. They come together to formulate something truly special. The smooth film editing by Ramzees and Luis Carvalho are further evidence of these high-quality characteristics solidifying to evoke brilliance. In its quick-moving runtime it creates an atmospheric mood. In an exhibition of the artistry on display this is done before the story even begins to unfold. It carries this impression out effortlessly. All the while it is constantly building upon this solid foundation. We are issued mounting trepidation throughout. In turn, “Dead Hearts” is a persistent wall of ever-increasing suspense. It grips us with increasing intrigue until well after its elegiac, and cleverly wrought, finale. We remain mesmerized, awe-struck by how well conceived the sum of this exertion remains. This is especially remarkable given its compact length. The composition creates an illusion, brought forth by its genuine dialogue, performances, zombie make-up and effects, that we are with our leads.This is a credit to the incredible talent all around. “Dead Hearts” has an obvious affection for the sub-genre it is rooted in. It showcases a knowledge of undead works of yore. Yet, there is also an abundance of originality here. Carvalho’s brief film is distinctly its own entity. It is always fresh, vigorous and smart. Moreover, it is endlessly engaging, gripping and terrifying in ample doses. “Dead Hearts” is riveting. It establishes Carvalho as a great new talent. Simultaneously it breathes fresh life and perspective into the much documented account of cannibalistic ghouls. This is a must-see. It is a testament to how much can be done on a small budget. Furthermore, it proves the potency inherent when the components of affection and respect, as well as a phenomenal natural aptitude, for the craft and the composition being operated on unify among the respective contributions of all involved. We live in a world where often we become so accustomed to a certain stroke of luck, whether it be good or bad fortune, that we almost expect it, feel it and await its presence. Some of us go about our daily routines in this state. “Please Punish Me”, from director Chris Esper (2014’s “Always a Reason”, “Steak Knives”), is a meditation on such circumstances. It is balanced with splendid performances, beautifully humanized characters and ample doses of humor and heart. The tale it tells in its quick-moving and smartly paced thirteen and a half minutes is that of a businessman named Scottie Lee (David Sackal in a tremendous and quietly moving performance). He is having a long streak of positive events transpiring in his life. Among these incidents is climbing the corporate ladder, which he admits in a soul-bearing scene that he hasn’t even attempted to do, and he just can’t understand why. Our lead is a man who just wants to be an artist. But, for his success he feels the need to be disciplined for what he deems to be his “curse”. This is when he turns to a place that dispenses such treatments at a price. Here he meets the woman meant to incorporate this specific brand of punishment, Michelle (Joanna Donofrio in a role which captures all the layers of her character incredibly well). From this point on the two find an unexpected bond. With this wells an honesty flourishing where should be an exercise in momentary pleasure. Rich Camp’s screenplay, from a story by Tom Paolino, is tremendously done. In its sparse runtime we leave this short feeling as if we sat down and conversed with them ourselves and know them intimately. The first half is full of winning, well-timed, delivered and genuinely side-splitting gags. When we get to the second portion of the narrative we are drawn in by the poignant turn in the chronicle. Camp has provided a delicate balance of opposite tones. It is one that he has done a phenomenal job of bringing forth on the page. With Esper’s talented directorial hand bringing the story to life on-screen, with help from Mark Phillips’ sharp cinematography and Steven Lanning-Cafaro’s original score, “Please Punish Me” showcases talent in all technical arenas. This is further aided by Felipe Jorge’s film editing, Jorge Mario Tobon’s sound work and Chad Kaplan’s delightful contribution to the striking animation in the opening sequence. Make-up artist Stefani Plante and hair stylist Nicole Bertoni do a phenomenal job as well. This is a work that is emotionally searing, illuminating and beautiful all around. It is light and breezy when it needs to be. Still, it is also ultimately tear-jerking, poetic and heartfelt. Esper has crafted a gargantuan accomplishment. He has established a triumphant victory juggling the story’s many moods evoked with effortless gusto. Among its various accomplishments is ending on a note that is both thought-provoking, contemplative, genuine, brilliantly understated and real. Most full-length films would not be able to establish their characters as well as “Please Punish Me” does in under fifteen minutes. Furthermore, it would not make us feel for them the way Esper and his cinematic crew does here. This is lively, but potent, material. It is inspiring, gentle and cathartic. Moreover, it wisely finds the right fit to execute the narrative with a sense of natural love. It also incorporates an optimism that is delicate, stalwart and frank. “Please Punish Me” received great acclaim from the 401 Film Festival. I can see why. It is intelligent, cinematic art. 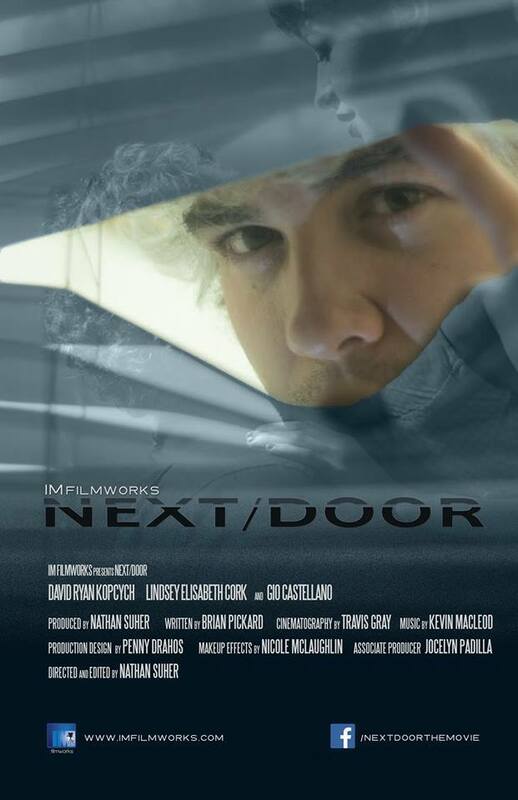 Director Nathan Suher (2014’s “Right There”, 2015’s “Scary Little F*ckers”) and writer Brian Pickard (The Leslie Taylor Show) issues a Hitchcockian mastery of tone and ever-heightening intensity in the twenty minute thriller, “Next/Door”. From its commencing moments of chilly silence, even before the unnerving psychological portrait Suher and Pickard have in store is introduced, we can sense something is amiss. We note this in the quiet presentation of the title card. It is visible beneath the menacing isolation captured in the camera’s slow pan to the home where “Next/ Door” and its immediately alarming narrative commences. It also signifies an eerie prelude, hidden in the unearthly quiet, to the labyrinthine twists which Suher and Pickard utilize with rapidity and mounting fascination throughout. We are immediately in instant admiration, and endlessly intrigued, by both the set-up and the talent on display. Awakened by an argumentative couple’s spat heard through the walls of his home the lead, Otto, in a tremendously realized and multi-layered portrayal by David Ryan Kopcych, senses violence. After his neighbor, Hector, leaves he goes over to the neighboring residence where the conflict sprang to check on the situation. What he uncovers is a scene so startling it cannot be given away but, only seen and witnessed. This is a pulpit of intrigue that “Next/ Door” uses as a launch pad. It is a springboard meant to engage us. This is also meant to make us challenge our own surroundings throughout. Such attempts it carries out masterfully. The way Suher and Pickard play with Otto, as well as the sudden situation he is thrust into and what transpires becomes of it, is inventive and ingenious. It is also one of the many ways the tale remains fresh and vigorous at every turn. What Suher and company have crafted here is endlessly watchable. It is also complimented by a swift-moving runtime. “Next/ Door” hinges on its ability to successfully build an ever-increasing sense of dread and unease. It executes this with skill. This is thanks largely to its fervent, palpable credibility and charisma. We see this pulsating beneath the incredible talent the performances convey. Lindsey Elizabeth Cork, as the object of Otto’s strange obsessions, Patty, and Gio Castellano, as Hector, bring their respective characters to life. These are all genuinely stalwart acting turns. There is an immediacy to all of the enactments that makes the proceedings all the more realistic. In turn, it makes the tension all the more relentless and stirring as it resonates on-screen. We believe these characters. Furthermore, we’re involved with them. We care about them and their well-being. This is a sympathy, a concern many horror works try to evoke but fail at miserably. “Next/ Door” is captivating, breathlessly suspenseful and gripping material. It is also beautifully written and brilliantly directed. Moreover, it is break-neck paced throughout. To its further credit, Travis Gray’s gorgeously grim cinematography captures every taunt plot element with nuance. Gray drapes the work in a veneer that is impeccable and well-suited for the attitude of the account itself. This stunning characteristic, along with an equally atmospheric score from Kevin MacLeod and seamless film editing from Suher himself, all comes together to create a nerve-jangling rollercoaster ride. Excellent make-up work by Lauren Buckman and Nicole McLaughlin and exceptional sound work from Luis Carvalho and Nelson Reis heighten this point. These are among the various reasons that you don’t just watch “Next/Door”: you experience it. Suher’s latest pulls you immediately in its initial seconds. It encapsulates and grips the audience’s imagination. Furthermore, it challenges our own sensibilities long after it has finished. To say this short is simply “haunting” is quite the understatement. “Next/ Door” is a searing exhibition of what Suher can do as a director and craftsmen. Among its numerous charming attributes is how much narrative it holds in its small span. This is a gift to, not only fellow admirers of the horror genre, but those who appreciate filmmaking in general. Because of this I eagerly look forward to seeing what other cinematic wonders Suher will present us with in the future.